Seriously, Chicago? You're drunk. Go home! After an absolute incredible weekend, that statement is the only thing that I have wanted to say to Chicago. My hometown. The town that literally makes me think Mother Nature is drunk on a regular basis. 70-degree weather one day and then 30-degrees and cloudy/rainy/misting the night?! Why do I live in Chicago? (Says every Chicagoan during the colder months.) Mind you it started snowing this morning when I was at the gym. SNOWING! Again, just another reason Mother Nature is drunk. I've been trying hard lately to start developing my own recipes. A lot of times I find recipes in cookbooks or on food blogs that I want to try and just go with that. Or I will use it as inspiration and make my own tweaks. But what I really want to do it come up with something all on my own. Trust my instincts and come up with something incredible. One thing that that requires that I do not have ample supply of is time. I'm constantly doing something. And when you have awesome recipes like this one from Sam Talbot's The Sweet Life, why wait to see if something tastes good when it is safe to say this does? Now don't judge, I am going to work more on recipe development, but for now, while I am starving and short on time, I am going to eat this ridiculous (good) recipe from Sam. It would be fair to say that breakfast is my favorite meal of the day. Even though I do not eat breakfast everyday. There is nothing better than a delicious fresh breakfast to start your day. Brunch? I'm obsessed. Pancakes, French Toast, potatoes, eggs, fruit, coffee. I want all the foods. 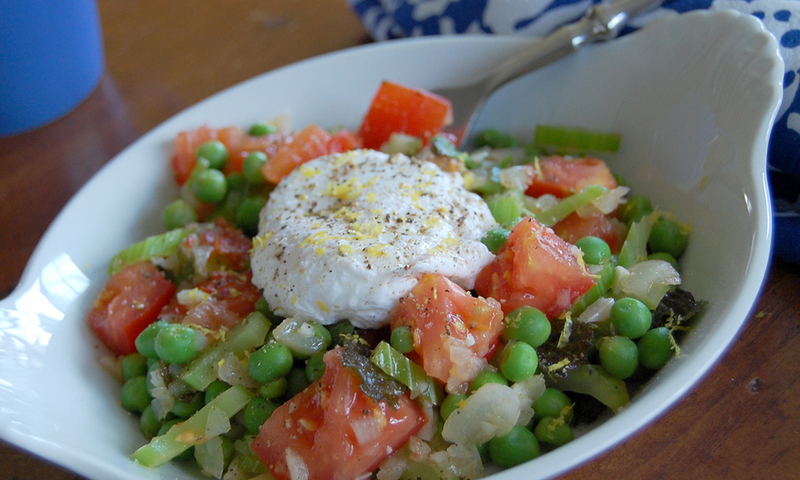 For mornings at home, these peas with mint and soft poached eggs are perfect. Make it for that special someone (served in bed with a cup of coffee) and you're sure to get lucky. Enjoy! Bring a large pot of water to a boil over medium-high heat. Blanch the peas in the boiling water until they turn bright green, about 25 seconds. Drain in a colander and run them under cold water for 30 seconds to stop the cooking. Set aside. In a large saucepan, combine 4 cups of water with the vinegar, salt, and 1 tablespoon of the lemon juice. Bring the mixture to a rapid simmer over medium-high heat. Crack the eggs on the side of the pan and gently slip them into the water. Let the eggs settle into the liquid and cook until coagulated, about 3 minutes. Using a slotted spoon, transfer the cooked eggs to a shallow plate. In a large skillet, heat the oil over medium-high heat. 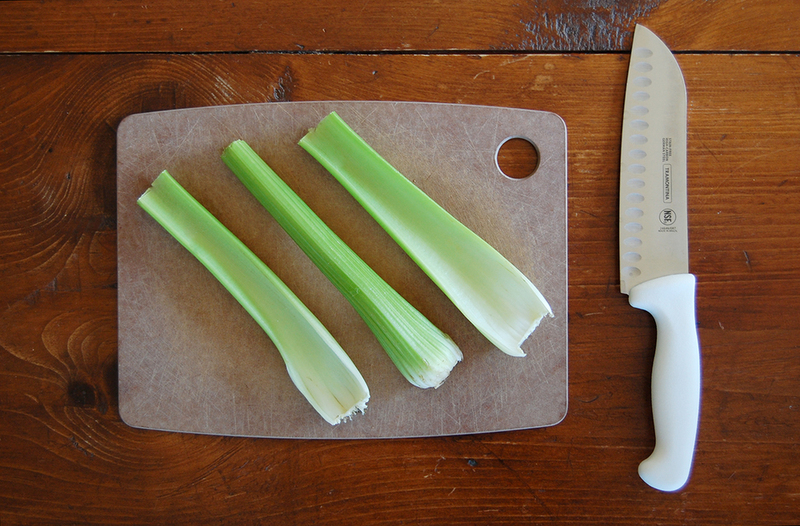 Add the celery, onion, and garlic and cook until translucent, 2 to 3 minutes. Add the mint, tomatoes, and blanched peas. Season to taste with salt and pepper and sprinkle with the lemon zest and juice. Toss well to combine. Divide the pea mixture among 4 plates and top with 2 poached eggs per serving.